Ingres was neither a revolutionary, nor a conservative, nor a romantic. Most of all he was interested in the form. Not an ideal form, but associated with the originality of the objects depicted. 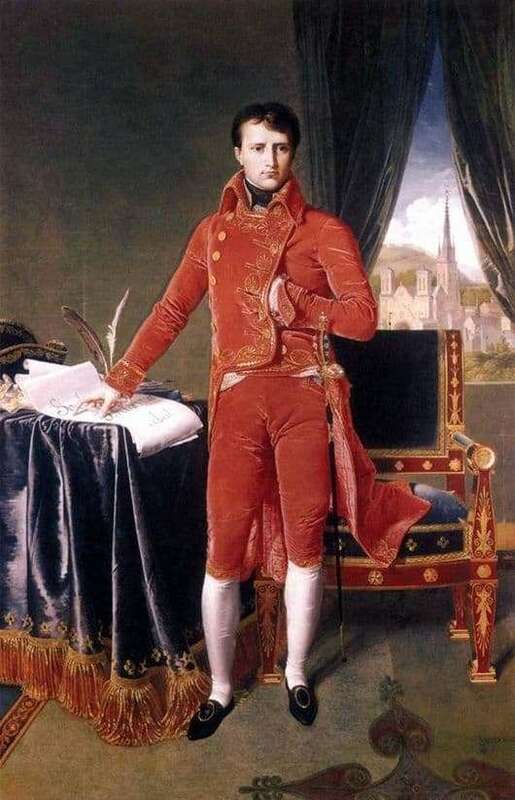 “Consul Napoleon” – the first Napoleon portrait of authorship of Ingres. The second portrait was written two years later, when Napoleon was already emperor. We see a portrait of a young man in a red velvet uniform. He stands at full height next to the table, with his right hand on the scroll. Even then, the famous Napoleonic gesture was born – the left hand was hidden behind the uniform. Against the background there is a dark drapery and curtains matched to the tone, further emphasizing the solemnity of the moment. From the window you can see the castle. Ingres was the first to reduce art to a peculiar vision of the artist. Despite the fact that his canvases have a classical orientation, his work was very interested in the artists of the next generation of impressionists, post-impressionists, and even Pablo Picasso himself. Napoleon was interested in Engra, not so much as a great conqueror, as much as a historical person capable of setting goals and achieving them. In the artist’s understanding, Bonaparte is a hero of France. Ingres has never been a battle painter. Therefore, the picture shows not General Napoleon, a man with a unique military career, who has already passed a series of well-known campaigns, but a Napoleon politician who completely changed the country’s political life. This can be seen in the civilian clothes of the consul, in his mimicry, transmitted by the artist. To some extent, the picture was unsuccessful. Ingres was about to send a portrait to the exhibition, but by that time Napoleon had assumed the imperial title. Accordingly, the picture in which he was depicted as a consul, has lost relevance. Today, the “portrait of the consul” is considered one of the best images of the young Napoleon.